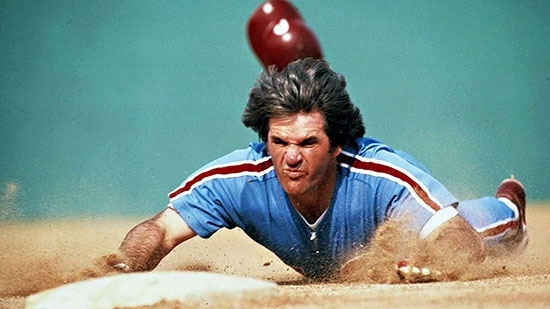 The Philadelphia Phillies announced on Monday afternoon that Pete Rose will be the 2017 inductee into the Phillies Wall of Fame. Rose was selected by fan voting on the Phillies website this past winter. He will join 38 other inductees with his own bronze plaque out in Ashburn Alley. Rose played for the Phillies from 1979-83, helping the team to two National League pennants and the World Series Championship on 1980. Despite being the all-time MLB hits leader, among other accomplishments, Rose has been banned from baseball since 1989 for betting on the game. That ban includes induction into the Baseball Hall of Fame in Cooperstown. Recently, MLB has allowed individual teams to honor Rose if they get permission first. Last year, the Cincinnati Reds added him to their Wall of Fame. The Phillies got permission this off season and added him to the fan ballot. Rose said in a statement, "I am very honored to be inducted into the Phillies Wall of Fame. My baseball years in Philadelphia were amazing, not just because we won it all in 1980 and came close in 1983, but also because the fans welcomed me from day one," Rose said in a statement released by the team. "The team's great ownership and talented roster attracted me to Philadelphia as a free agent. I knew we could experience great success." The ceremony will be held before the game on Saturday, August 12th against the New York Mets during Alumni Weekend. Three men have been charged with a string of convenience store robberies this past winter. 18-year-old Nazear Newton of Huntington Valley, 19-year-old Quentin Archie of Philadelphia, and 19-year-old Phillip Coleman, Jr. of Philadelphia are accused of nine armed robberies of 7-11 stores in Philadelphia, Bucks, and Montgomery Counties. The robberies took place between January 21st and February 21st. They were arrested following the last robbery of a store in Ambler. An officer responding to the scene noticed a car matching the description of the suspects' vehicle. He pulled it over after they failed to use a turn signal. The officer noticed a suspicious amount of cash in the car. The clerk of the store made a positive identification of the robbers. Police were able to use surveillance from the other robberies and interviews to connect them to the other crimes. They are charged with criminal conspiracy, robbery, possession of a firearm with altered manufacturer's number, theft by unlawful taking, receiving stolen property, firearms not to be carried without a license, criminal use of communications facility and other related charges. They are being held at Montgomery County Correctional Facility after failing to meet $1 million bail each. Five people were injured following an accident on the Blue Route in Delaware County this afternoon. It happened around 2:40 p.m. Monday in the southbound lanes of I-476 in Springfield, just south of the Media Bypass. It involved a SUV and a tractor trailer. The SUV was pinned to a concrete barrier by the truck. Several passengers has to be extricated. One person was taken to the hospital by helicopter, the other 4 were transported by medic. No word on their condition. All lanes of the Blue Route were shut down causing significant delays.